This past weekend’s storm let up long enough to allow for a pleasant drive up to San Francisco. ‘Tis the season for holiday parties and Christmas shopping and for making sure we get to see our friends before the December calendar gets too full. We met good friends at Marlowe Saturday night, one of the more popular restaurants in the city. 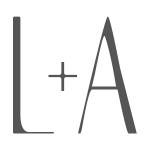 Marlowe offers casual dining with a focus on American bistro dishes with typical San Francisco flair. Steak tartare, brussels sprout chips and roasted bone marrow share the menu with steak-n-fries and the good old burger. I had a crab cake with shaved celery and Mandarin oranges and a perfectly-moist pork chop but the menu item that made the biggest impression on me that night was one I didn’t even order. I love, love pistachios. In fact, they compete with almonds for my affection. But give me a dinner menu and my eyes will almost always gravitate towards the dishes I just mentioned–crab cakes, pork chops and yes, bone marrow. Thank goodness for a friend who saw the potential in the first item on the menu: toasted pistachios. They were served in a small, half-full mason jar, unimpressive at a glance. I was hungry, though, so I sampled one….then I reached for another. In no time at all the jar was empty and all six of us agreed to order another. 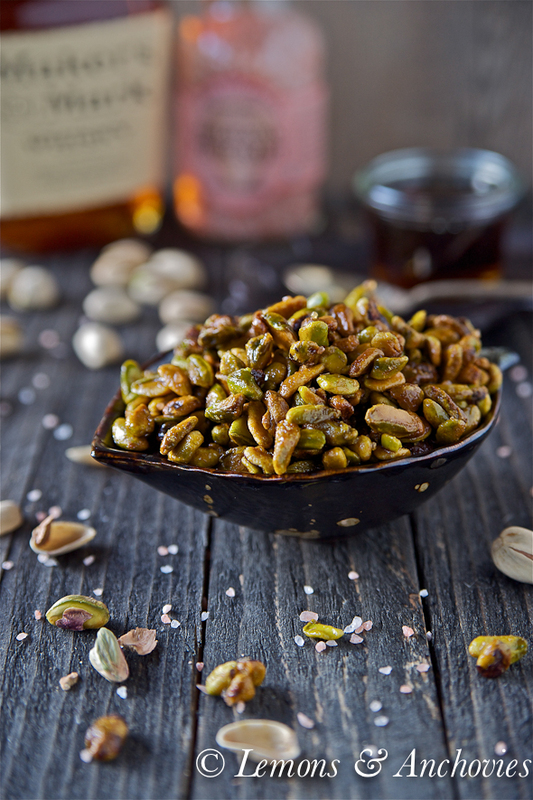 Slightly sweet, a little salty and with just a hint of the bourbon, these pistachios were very hard to resist. I’ve roasted almonds before but there was something about the bourbon and maple syrup in the pistachios that really spoke to my taste buds. I couldn’t wait to try them at home. The next day I picked up a bag of shelled, roasted, unsalted pistachios along with my very first bottle of bourbon. I had no idea that bourbon was a type of whiskey*; it took a few minutes to scan the contents of the liquor aisle to find what I needed. Besides this and maple syrup, the menu at Marlowe listed smoked salt as another key ingredient–no luck finding this so I settled for Himalayan pink salt that I’ve had waiting to be used. I played around to find the right measurements for the bourbon, maple syrup and salt and toasted the pistachios in the oven. As an afterthought I also added brown sugar to the mix because I wasn’t sure that the syrup would be enough. The result? My version hit all the right subtle bourbon notes and I think the sugar actually helped. Even with my addition, my pistachios are still slightly less sweet than the restaurant’s version. If you like salty and sweet together, you will enjoy these. 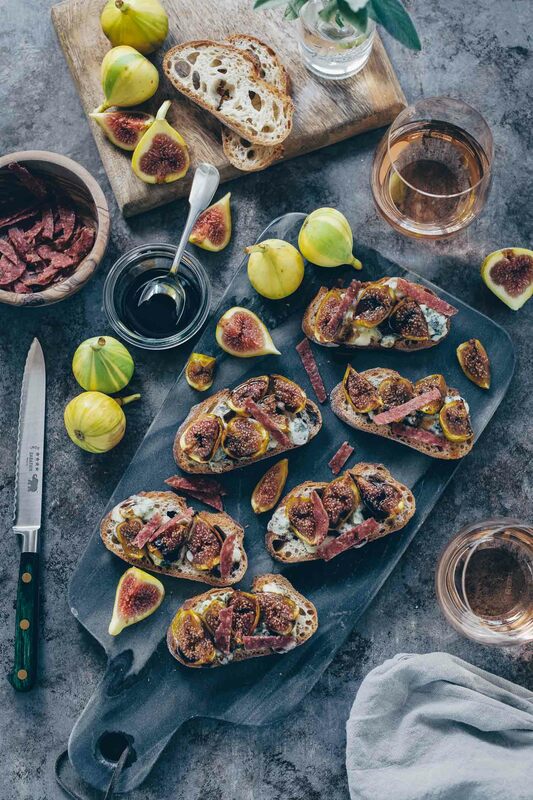 So go ahead and pull out that bottle of bourbon from your liquor cabinet–a splash or two in these toasted nuts will make your holiday table that much more festive. * The timing couldn’t have been more perfect for this post on Kentucky Bourbon at She’s Cookin’. If you’re a bourbon newbie like I am, you’ll really enjoy Priscilla’s write-up. ** These do get a little sticky because of the maple syrup so make sure you roast them in a single layer and if you double the batch, reduce the amount of maple syrup used. Check the notes in the recipe for other tips to reduce stickiness. 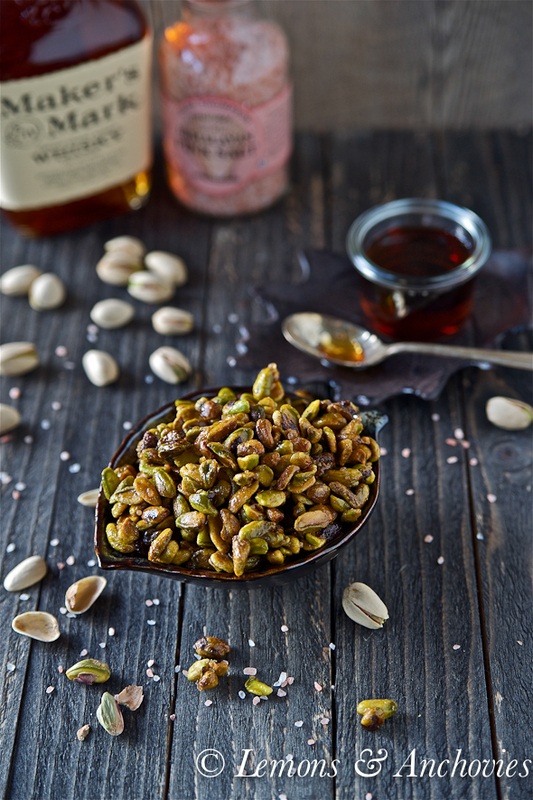 You can't go wrong tossing pistachios in bourbon and maple syrup--perfect as a holiday appetizer. Preheat your oven to 250°F and line a small baking sheet with parchment paper. In a medium bowl, combine all the ingredients together and toss well. My measurements for the bourbon, maple syrup and sugar are on the mild side so feel free to add a bit more to suit your taste but don't be tempted to add more salt. ¾ teaspoon should be enough, no more than 1 teaspoon. Arrange the pistachios in a single layer on the parchment-lined baking tray and toast the nuts for about 15 minutes. You may want to toss them once halfway through the cooking time. Allow them to cool to room temperature before serving. The syrup and sugar will cause the nuts to stick so you may want to separate them with your fingers and toss them on the pan before you transfer them to a bowl. These do get a little sticky because of the maple syrup so make sure you roast them in a single layer and if you double the batch, reduce the amount of maple syrup used. Here's a variation: roast the pistachios the same way but reduce the amount of maple syrup and DO NOT add the salt just yet. Allow the nuts to cool slightly in the pan. Combine a bit of turbinado sugar and the salt in a large bowl and toss the pistachios in the mixture after they have cooled a bit. Then lay them on the baking sheet again in a single layer and let them cool completely. The salt-sugar coating should help to reduce the surface area covered in the sticky maple syrup. These pistachios sound incredibly addicting (in the best possible way!). It’s easy to see why you ordered a second jar! Love maple flavor and pistachios are one of my favorite nuts so I’m digging this recipe here, great job Jean. Love this recipe and idea, Jean. 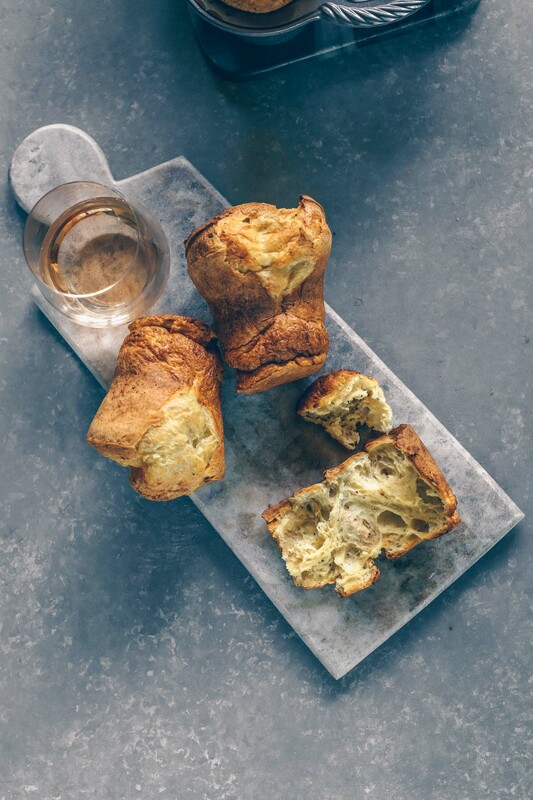 For nibbles or maybe topping on a baked good – it has to be delicious. I can taste it already…will be making these! I love pistachio’s too (and Bourbon!). 🙂 Your version, with the splash of brown sugar, actually sounds better than the original! This looks really yummy and a great gift idea! Now that’s a fancy treat and I love pistachio too! Those look incredibly good! I bet they are quite addictive. This looks superb! Definitely a great treat during the holidays! I love the sound of these – perfect for the holidays! Jean, this is a fabulous idea! I am going to make this for my Hubs – a huge pistachio fan! Thank you! Me, too! I love, love, love pistachios! Seriously, I really believe this is the wrong time for me to start my weight loss “program”. With all the delish foods everyone’s making, I am seriously in trouble…I want a taste of that, a sip of this, a bite of that, a nibble of this…So hard to resist! Yum! I think these would also be spectacular on a salad and I just happen to have a small bag of smoked salt that I was waiting for just the right recipe for. I’m running to the market first thing in the morning! Thanks! Greg! That’s awesome–how exciting! I’m still waiting for your savory pies to be released. Now I have two things to look forward to, yay! I’m definitely going to be gifting these to all the boys in my life this holiday season; oddly enough they’re all pistachio and bourbon junkies. Love the bottle of makers mark hiding in the background! It’s a great bourbon, and not too overpriced. Jean – I need to eat at Marlow – have not been there yet. Loved how you duplicated the ones you had there. I too am obsessed with nuts and the variety of flavors you can add to them. I am making these for SURE. Love your photos!!!! Definitely can’t go wrong with maple syrup and bourbon! These pistachios look awesome! My husband would absolutely love these! His loves pistachios and the salty/sweet combination! What great flavors! You can’t beat maple and bourbon together. Salty-sweet combinations are my favorite and I love pistachios, so this is a win,win for me! I have been experimenting with the same kind of nut snack with sorghum that I bought on the bourbon trip, but they were too sticky – I’ll have to rework it for round 2 as I really want to do another bourbon post featuring their products. Thanks for the link and Happy Holidays! I love making glazed and/or spiced roasted nuts around the holidays…but I’ve not used pistachios before. They look delicious! Plus the color is perfectly festive. This is something I could snack on and would end up eating it for dinner! Love these flavors and the bourbon-wow! Really nice idea, Jean. I love pistachios, but this is the first time I’ll try them sweet. They look delicious! Oh my, these sound absolutely amazing. 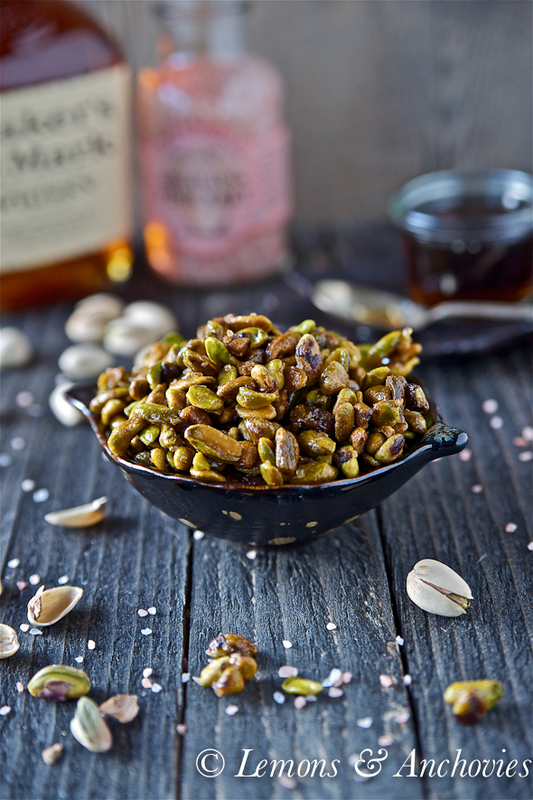 I love roasted nuts, but have never thought to try pistachios, and well, the addition of bourbon wow! My husband would love these. Help! Just finished making my first batch of these tasty Bourbon Pistachios. They are VERY sticky. I doubled the batch. Maybe too many at once? Any suggestions? Thanks for the help. Sorta the direction I was going. Super tasty just a little messy for a gift jar. Such wonderful flavors for pistachios…delightful for the season! Sounds incredible! 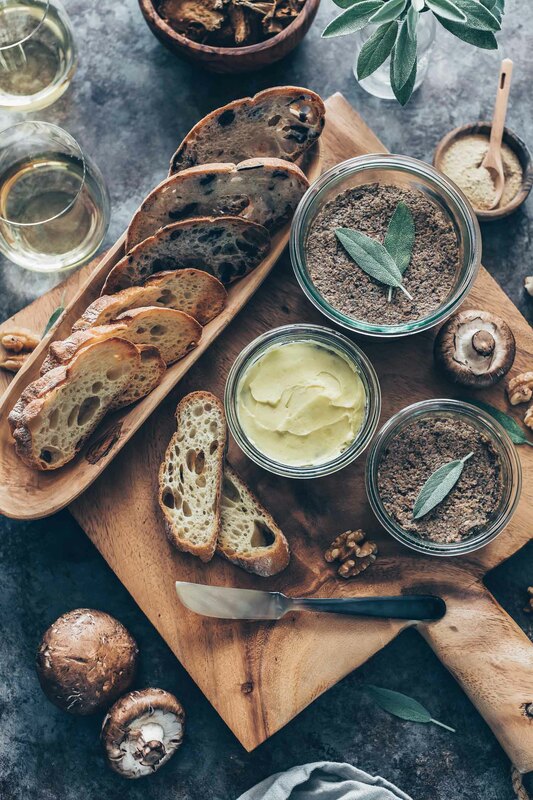 If the pistachios I have are raw, should I dry roast them first (5-10 minutes at 350 degrees) before attempting this recipe?